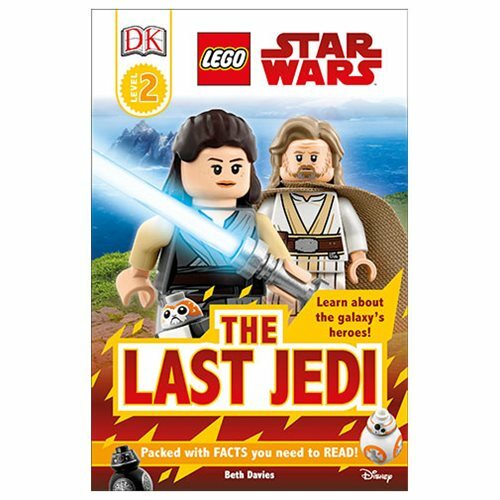 Join Rey, Poe, Rose, and Finn on their adventures in this exciting LEGO Star Wars: The Last Jedi DK Readers 2 Paperback Book for children learning to read. Packed with images from LEGO Star Wars sets, this book is a fun way to meet the brave heroes of the Resistance and the villains of the First Order. Read about General Leia Organa and her friend Vice Admiral Holdo. Find out about Kylo Ren and the First Order's stormtrooper soldiers. Learn about the Force and explore the story of the Jedi. This 48 page paperback book measures about 9-inches tall x 5 9/10-inches wide.